For the last several years, each July, Aaron and the boys and I rent a house we love—a blue house with a wide porch and bright pink hydrangeas. We walk to the beach and the pier and the ice cream shop. We take the boat out every day, sometimes twice. We buy most of our produce at the farmer’s market, and we pick blueberries and cherries to freeze and eat all year long. It’s a three-hour drive to this small Michigan town from our house outside Chicago, but they feel worlds apart. I can feel myself exhale as we exit the highway and turn onto Phoenix Street, and the first glimpse of the water makes my heart leap every single time. And so as is our custom, we arrived at the lake that July, breathless from travel, sleepless from kids, wrung out from a writing project that still wasn’t finished. Looking back, it’s easy to see now that I was at my worst: weepy, snapping at everyone and everything, anxiety sky-high; deep connection to myself, to God, to the people I love most at an all-time deficit. That July began the invitation to a new way of living, and each subsequent July has been a reset, a recalibration, a deeper invitation. It’s July once again, and I would never tell you that I’m finished with this journey, all fixed up, nailing it. but I will tell you, with great gratitude and joy, that I am fundamentally changed, rebuilt from the inside. I have left behind some ways of living that I once believed were necessary and right that I now know were toxic and damaging—among them pushing, proving, over-working, ignoring my body and my spirit, trusting my ability to hustle more than God’s ability to heal. My life is marked now by quiet, connection, simplicity. It has taken every bit of more than three years to learn these things, and like any hard, good work, I fail and try again more often than I’d prefer. But there is a peace that defines my days, a settledness, a groundedness. I’ve been searching for this in a million places, all outside myself, and it astounds me to realize that the groundedness is within me, and that maybe it was there all along. I’ve always trusted things outside myself, believing that my own voice couldn’t be trusted, that my own preferences and desires would lead me astray, that it was far wiser and safer to listen to other people—other voices, the voices of the crowd. I believed it was better to measure my life by metrics out there, instead of values deeply held in my own soul and spirit. And in the same way, I’ve always given my best energy to things outside myself, believing that I’d be fine, that I was a workhorse, that I didn’t need special treatment or babying or, heaven help me, self-care. Self-care was for the fragile, the special, the dainty. I was a linebacker, a utility player, a worker bee. I ate on the run, slept in my clothes, worshiped at the altar of my own to-do list, ignored the crying out of my body and soul like they were nothing more than the buzz of pesky mosquitoes. Now I know that in the same way I’ve always believed God’s Spirit dwells deeply in this world, it also dwells deeply in me. I’ve known that, cognitively, but my life spoke otherwise. Now I know that the best thing I can offer to this world is not my force or energy, but a well-tended spirit, a wise and brave soul. My regrets: how many years I bruised people with my fragmented, anxious presence. How many moments of connection I missed—too busy, too tired, too frantic and strung out on the drug of efficiency. Now I know there’s another way. You don’t have to damage your body and your soul and the people you love most in order to get done what you think you have to get done. See Shauna Niequist LIVE at the BELONG Tour! 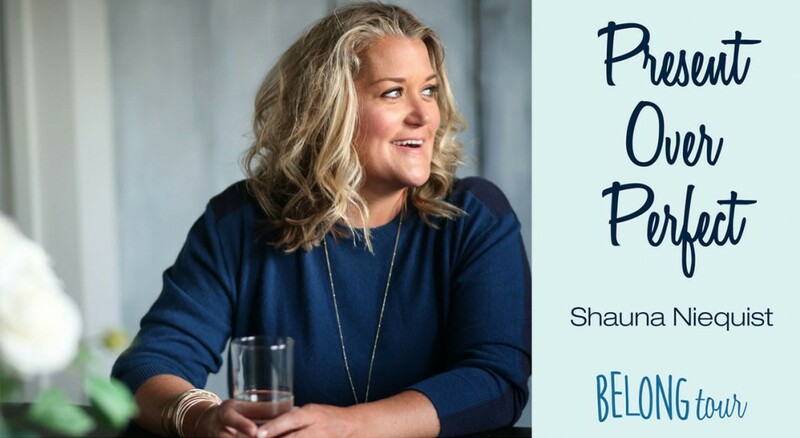 Shauna’s Present Over Perfect message is great in print but it’s even better in person. Join Shauna, Jen Hatmaker, and friends at a BELONG Tour event near you—enter to win 5 tickets to the BELONG Tour of your choice or save $20 of tickets with code MOPS20.